The Essa Stallions had another tough stretch of games this past weekend, which included 2 away games in a 3 games in 3 nights scenario. Didn't bother them one bit, as they were able to claim all 6 points, and remain at the top of the CPJHL Standings! Friday night saw the Stallions travel to Scarborough, ON to take on the Wexford Raiders. A tough start to the game for the boys, regardless of outshooting the Raiders 20-7 in the first period. The rest of the way however, was a different story. Alex Wahlstrom (his first of two on the night) got the boys going with a PP goal in the 2nd, and that was all the boys would need. Stallions would pepper the Raiders goal, out shooting them 55-17, and notching 4 more, for a 5-0 nothing win! Matthew Server stopped all 17 shots he faced for his first CPJHL shutout! "We got back to playing Stallion hockey tonight. Overall was a good performance. Server made some key saves when we needed him to, and we were able to bury some for him. We've got two (games) more this weekend, so now our focus shifts to them" said Head Coach and Director of Hockey Operations Sylvain Cloutier. Saturday night, "The Herd" welcomed the visiting Wexford Raiders to "The Barn" for the 2nd game of a home and home series. That night would be more of the same for the Stallions, as they would jump out to an early lead, and never look back. The final score would end up 10-1 in favor of your Stallions! Ethan James would own the crease, getting the win in making 16 saves. Essa outshot Wexford 84-17! "Much better effort from the guys tonight, for a full 60 minutes. Everyone is starting to buy in to what we're teaching. We had a couple of mental lapses in some situations, but we're getting there. Bit by bit we're here to get better. That's why we do, what we do. It's why we love doing it" said General Manager and Assistant Coach David Lang. "Now we're on to Brampton. New team, new mindset. Hope to go in there, get 2 points, and get ready for the showcase" Lang added. 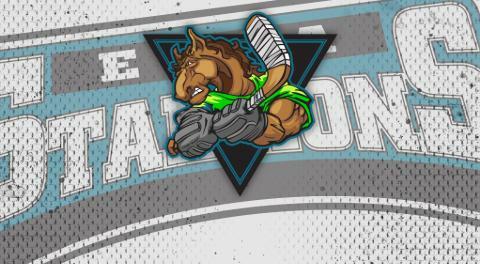 2 points was the goal for the Stallions, as they galloped down the 400 to the 407, heading to Brampton to take on the expansion and upset minded Brampton Royals. In what was a lackluster game on both sides, Essa was able to pull away in the 3rd period, having the game end in an 8-3 decision for The Herd. Young goaltenders Zach Rowe and Kyle Denney split time in the cage, both earning some playing time and respect from there teammates. A Job Well done! "It was good to get our young guys into a game. We had 7 guys get in there tonight, who don't normally get to play. Go out there, earn some playing time and cut there teeth on how junior hockey is. We're proud of how they handled themselves. How far they have come, but we still have a long way to go" said Cloutier. "Now we look forward to heading south for a few days, and playing the CPJHL Showcase in Potsdam, NY". The boys now look to the CPJHL Showcase. 4 games in two days. Follow along on our Twitter and the CPJHL for updates!